L: 82" x W: 60.5" x H: 63"
Tiffany Full Bed Make your bedroom look glamorous with the Tiffany full bed. Its Hollywood-inspired design is truly dazzling with its crystal-look tufting and stunning silver finish. The cream-colored, leather-look upholstery is so stylish, plus provides a place to rest your head while reading or watching TV. Faux snakeskin accents adorn the trim for even more flair. Make your bedroom look glamorous with the Tiffany full bed. Its Hollywood-inspired design is truly dazzling with its crystal-look tufting and stunning silver finish. The cream-colored, leather-look upholstery is so stylish, plus provides a place to rest your head while reading or watching TV. Faux snakeskin accents adorn the trim for even more flair. 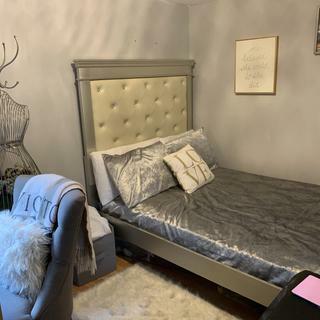 Purchased this bed for my 15 yr old and she fell in love with it especially the sparkling headboard. The delivery guys came early which was awesome and they were so fast and polite they even did me the favor of putting the mattress on the bed which they didn’t have to. Highly satisfied with the service overall and the price was even better I paid $300 less then other places. Thank you!!! Hi Cynthia, we're so happy you and your daughter love the Tiffany bed! This bed is the perfect addition to my bedroom. It makes my room complete. 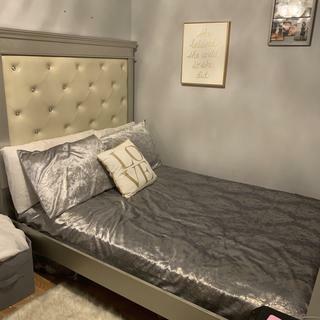 The perfect glam bedroom feature with the shiny headboard it’s the perfect feature piece. Pros: The elegant look of it and, it can easily be moved by simple hooks at the base and head of it. Perfect for someone like me that is always changing things up and makes it less likely to damage bed. Cons: At that price point the bed is beautiful but not real wood I have had it for a couple of weeks now and don’t want it to get ruined. I’m really careful not to bump anything next to it to damage it. I Love How High The Back of the headboard is. Great bed. The headboard was a bit taller than expected but looks like it fits the size of the bed. We love the way it looks. What kind of mattress do I need for this bed? BEST ANSWER: As we have a large selection and it can be a personal choice, we will be happy to assist you in selecting the best mattress for the Tiffany Fully Bed, and your situation. Please call 866-383-4484, option 3. Would I need a box spring? BEST ANSWER: Yes, a box spring is required for the Tiffany Full Bed. Is this item available in stores? Does this fits a full size adjustable bed frame? BEST ANSWER: The Tiffany Full Bed will accommodate a full size adjustable base.